An ethnography of an Alcoholics Anonymous chapter in Mexico City. Staying sober is a daily struggle for many men living in Mexico City, one of the world's largest, grittiest urban centers. 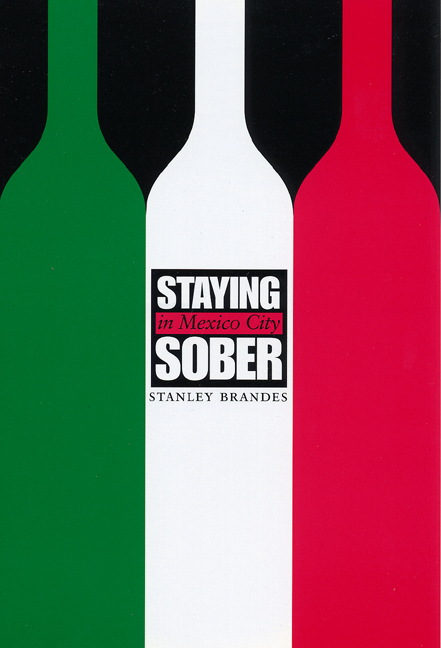 In this engaging study, Stanley Brandes focuses on a common therapeutic response to alcoholism, Alcoholics Anonymous (A.A.), which boasts an enormous following throughout Mexico and much of Latin America. Over several years, Brandes observed and participated in an all-men's chapter of A.A. located in a working class district of Mexico City. Employing richly textured ethnography, he analyzes the group's social dynamics, therapeutic effectiveness, and ritual and spiritual life. Brandes demonstrates how recovering alcoholics in Mexico redefine gender roles in order to preserve masculine identity. He also explains how an organization rooted historically in evangelical Protestantism has been able to flourish in Roman Catholic Latin America. Stanley Brandes is Professor of Anthropology at the University of California, Berkeley. A California physician once cautioned me that there exist two drugs which are exceptionally powerful, but omnipresent and readily available: caffeine and aspirin. Both are ingested daily with very little caution or forethought. If they came on the market today, he claimed, they would require FDA approval. The problem is that they are socially acceptable, a fully integrated part of American and European lifestyle, and therefore far beyond the point of governmental control. There is a third drug, alcohol, which is also ubiquitous, potentially dangerous, tightly woven into the social fabric, and only partly controlled. Unlike caffeine and aspirin, about which the public expresses little awareness and concern, alcohol has been the subject of intense public debate for over a century. Perhaps the difference lies in the fact that one consequence of imbibing—inebriation—becomes immediately apparent during the drinking episode. Another relevant factor is that alcohol, unlike other socially acceptable drugs, is layered with intensely religious and moralistic meaning. Wine is the subject of biblical commentary, a substance of sacred significance, the subject of countless proverbs and folk beliefs. To drink or not to drink always demonstrates one's social affiliation, whether based on gender, class, ethnicity, social rank, or age. For many people, alcoholic drink represents degrees of goodness or badness, illness or health. There is no place or time in which alcohol has been blessed with complete social and moral neutrality—except, of course, where it has been entirely absent. Moreover, as Dwight Heath points out (1988:397), drinking norms "are often endowed with a strong emotional charge"; they are "affectively loaded." It is perhaps for this reason that alcohol use and abuse have spawned an abundant anthropological literature, largely grounded in understanding the drinking patterns of particular ethnic, linguistic, or national communities. A generation ago David Mandelbaum (1965:282), a pioneer in the anthropological study of alcoholic drink, asserted, "When a man lifts a cup, it is not only the kind of drink that is in it, the amount he is likely to take, and the circumstances under which he will do the drinking that are specified in advance for him, but also whether the contents of the cup will cheer or stupefy, whether they will induce affection or aggression, guilt or unalloyed pleasure. These and many other cultural definitions attach to the drink even before it touches the lips." This statement amounted to a blueprint for field research. It initially stimulated a great number of ethnographic and cross-cultural studies, which, together with their own intellectual offshoots, have developed into a fairly sizable sub-field. Considering the ubiquity of alcoholic beverages, and their interconnectedness with the economy, society, and culture of the people among whom they are found, it is surprising how little is known anthropologically about standard methods of treatment, especially in the Western world. In a recent overview and assessment of the field, Geoffrey Hunt and Judith Barker (1999:126) were moved to declare that "the available literature on either the anthropology or the sociology of drug treatment is sadly sparse." This statement holds true as much for alcohol studies as for social science research on less widely available drugs. While there are a number of brief anthropological analyses of treatment in cultures other than the U.S., book-length monographs based on fieldwork are scarce indeed. This situation is regrettable considering that, as Dwight Heath (1991:98) says, "researchers and policymakers concerned with alcohol and other drugs—like many in education—have become enthusiastic about the strength and potential of observational ethnography.... "
There exist at least two full-length volumes on Alcoholics Anonymous which are based on anthropological-style fieldwork and might therefore be called ethnographic. The first, by Mary Catherine Taylor, is an unpublished Ph.D. dissertation completed in 1977. The author focuses on what she calls the "recovery career" of alcoholics and bases her observations and conclusions on attendance at "a variety of meetings of different A.A. groups" (M. C. Taylor 1977:I). Although readers learn much about A.A. ideology and the social conditions that improve a member's chances for recovery, the study differs from the present one in that it remains general, rather than grounded in detailed investigation of a given group of sufferers and their ongoing interactions. Although the dissertation defines and elaborates stages of individual recovery, it is unconcerned with an important dimension within this volume: the fate of the group. The best recent example of a book-length ethnography on Alcoholics Anonymous is Alcoholic Thinking by Danny Wilcox (1998). This volume, although lacking a cross-cultural dimension, represents a serious step in the right direction. As suggested by the title, the book focuses on general matters of ideology as well as on recovery procedures as advocated within the Alcoholics Anonymous fellowship as a whole. It is concerned much less with the functioning of particular A.A. groups as miniature societies and subcultures, which struggle on a daily basis with issues of leadership, interpersonal rivalries, the imposition of social control, and the sheer viability of the meeting. Wilcox tells us that his book is "based on the author's 13 years of experience as a practicing alcoholic, his training as an anthropologist, and observation and participation at over 600 AA meetings" (ibid.:xii). Wilcox's fundamentally non-critical perspective derives from his own recovery from alcohol dependency and therapeutic involvement in Alcoholics Anonymous. Alcoholic Thinking is rich with information about the organization that has obviously played a central role in the author's personal life. However, both methodologically and ethnographically the book diverges from my own, which is grounded in the long-term observation of a particular group of recovering alcoholic men in a major Latin American city. The present book, which is the product of the serendipitous chain of events recounted in Chapter One, is at once narrower and broader than Alcoholic Thinking. It is narrower in that, unlike any other study that I know, it takes a single Alcoholics Anonymous group as its subject. It is broader in that it deals not only with the ideology of the men in this group, but also with their social relationships and group dynamics. I am interested less directly in therapeutic outcomes than in the fate of the group itself: in questions of leadership, social control, and the identity of individuals as members of the group. I initially followed this group by attending meetings two to three times a week for a period of eleven months, from August 1995 through June 1996. On at least three subsequent visits to Mexico City, most recently in March 2000, I revisited the group. On each such occasion, I reestablished contact with friends in the group and updated my observations. I therefore followed the group over a period of five years. This book largely concerns group transformations during the last half-decade of the twentieth century. As an in-depth, longitudinal study of a particular Alcoholics Anonymous group, it has possible implications for an understanding of twelve-step programs in general. The research is based on field notes, recorded into my computer after each meeting, as well as interviews, which I taped in the homes of group members and later transcribed and translated. I also visited men with their families, sometimes as they celebrated baptisms and other special events, at other times in more everyday circumstances. In solid anthropological tradition, I carried out all the research myself, with assistance only for purposes of transcription and translation of the taped interviews. Although the men were fully aware of my presence as researcher, and freely offered information through the elaboration of life histories, I neither taped nor wrote during the meetings themselves. Given the emotional intensity and intended privacy of meetings, it would have been distracting and disrespectful to scribble in a notepad during the delivery of personal stories. Any ethnography of Alcoholics Anonymous must deal explicitly with the issue of anonymity. On the one hand, as the reader will readily see, Alcoholics Anonymous in working class Mexico City is a lot less of an anonymous enterprise than one might imagine. At the very least, the identity of members is widely known to friends, relatives, neighbors, and, in fact, to anyone who might care to find out. For reasons considered at length throughout this volume, the content of intimate personal stories told during meetings is also a lot less private than most A.A. affiliates would consider ideal. The men of my study group are themselves concerned about the public revelation of intimate confessions, a situation which impels them to censor what they say during meetings. By contrast, in the privacy of their homes, I was able to elicit not only the range of personal thoughts that the men reveal in meetings, but also much more. I have full permission to use the interviews in publications. Much of the interview material itself replicates verbatim terminology which emerges in the formal presentation of personal stories, so that, by quoting from home interviews, I retain the flavor and authenticity of statements made during meetings. Wherever I cite individual statements, and, in fact, throughout the book, I employ pseudonyms. Moral Support, the name I have given to the group, is also a pseudonym, rather than a translation from the Spanish of the actual group name. Insofar as possible, I have also attempted to disguise the exact location of the group. Like Danny Wilcox, I was a participant as well as observer in the group. On a regular basis I would be called to the podium to speak. Unlike Wilcox, I have never suffered alcohol problems and therefore felt no need for recovery. This situation might have proven awkward were it not for the declaration of one group leader, who encouraged me to stay with the group and make it a subject of study. While on the podium one evening, he addressed me directly: "Estalin," he said, "You are not a double A. You are a triple A!" To make me feel as welcome as possible, he explained that there have always been people who attend Alcoholics Anonymous meetings not because they are themselves alcoholic, but rather because they are Admiradores de Alcohólicos Anónimos—Admirers of Alcoholics Anonymous—that is, A.A.A., rather than A.A. The men at first had difficulty pronouncing my name. The closest, easiest equivalent for them was "Estalin," or Stalin. "That's a Russian name, isn't it?" asked one of the men in the group shortly after I joined. In time, as I introduced myself dozens of times on the podium, the men each arrived at his own fair rendition of Stanley. At that point, I knew that I had become an integral part of their world. The research combined nicely with my daytime administrative work at the National Autonomous University of Mexico. Since I began my investigation near the beginning of my stay in Mexico City, when I still felt very much alone in the metropolis, the men were not only a source of information. They were companions, friends whom I would look forward to seeing as a way to fill long evenings. Over time I became a true Triple A, or Admirer of Alcoholics Anonymous, in that I held every one of the members of my group in high esteem and developed great affection for them. I am a less certain admirer of A.A. as an organization or therapy. The experiences of my group, when combined with a review of the available literature as analyzed in Chapters Seven and Eight, demonstrate that on this score the jury is still out. Alcoholics Anonymous in Mexico City is without doubt a source of intense emotional support for a great number of people with alcohol dependency. Whether it is the A.A. program, rather than some other combination of factors, which is responsible for their sustained sobriety, would be difficult to declare with assurance. What is certain is that A.A. has achieved enormous success, in the sense of being a high-profile presence, not only in Mexico City but also throughout the entire Republic. In Mexico, some patients with serious alcohol problems are held in psychiatric wards or other mental health facilities. There also exist a number of private residential recovery centers for addicts, but these are high-income facilities (Rosovsky 1998:167). By far the most common institutional resource for the treatment of alcohol problems is Alcoholics Anonymous. In the words of Haydée Rosovsky (ibid. ), who has devoted her career to studying Alcoholics Anonymous in Mexico, this organization "is, by far, the widest known resource of recovery reported by the general [Mexican] population, and it seems that an increasing number of professionals are promoting A.A." It is estimated that, in 1990, about five out of every thousand Mexicans above 15 years of age were members of Alcoholics Anonymous (Medina-Mora 1999:87). Informed observers believe that A.A. membership grows annually at approximately 10 percent per year (ibid), an enormously high rate for a self-help recovery organization. A central goal of this book is to explain the rapid proliferation of A.A. chapters throughout Mexico and, by extension, Latin America. As Mäkelä et al. (1996:27) state, although "AA is an American middle-class invention, ...the AA program has been adapted to a cultural tradition different from the movement's origins.... " Hence, by the end of the twentieth century, "Latin America accounted for almost one-third of the world membership of AA. This shows that the movement has spread well beyond the range of traditional temperance countries" (ibid.:28). Chapter Two is explicitly designed to address the issue of how and why Alcoholics Anonymous has become so popular throughout Mexico. Although I make no claims for the representativeness of the single group that I studied, a detailed analysis of its organization and development can reveal a good deal about the impressive geographic diffusion of A.A. and other matters, which extend far beyond one A.A. unit alone. In addition to explaining the striking proliferation of A.A. groups throughout Mexico, the book contributes to knowledge of masculinity in Mexico and Latin America generally. As explained in Chapter Five, the vast majority of A.A. affiliates in Mexico are male. Because alcoholic drink has been so critical to Mexican male identity, it is a challenge for the men of Moral Support, who abstain totally and absolutely from alcoholic drink, to retain their masculine self-image. A large portion of their meetings is devoted to redefining masculinity, in such a way that drinking becomes antithetical to rather than an intrinsic component of true manhood. In the current social climate, where gender identity is in rapid flux and subject to constant scrutiny and reevaluation, the men of Alcoholics Anonymous expend considerable creative energy searching for alternatives to the conventional meanings of masculinity in Mexico. The men of Moral Support are also all members of the working class who migrated to Mexico City several decades ago from rural communities throughout central and southern Mexico in the pursuit of better living conditions and a higher standard of living. Although in most cases they managed to achieve this goal, their lives eventually disintegrated to the point where they placed jobs and family at risk. Heavy drinking had given them a sense of lost control over their destinies. A few of the men were able to reestablish the respect of relatives and recover from financial ruin. Many of them, however, continued to exist on the most meager earnings at the time of my study. Their economically precarious existence, as well as the inability to establish satisfying romantic partnerships, emerged continuously in personal stories. An analysis of these stories, especially as carried out in Chapters Four and Seven, contributes to an understanding of the social suffering of poor people in urban Latin America and stimulates a rethinking of the relationship between satisfying employment and alcoholic consumption. The men's preoccupations with money and survival were evident throughout my association with Moral Support. As demonstrated in Chapter Three and the concluding chapters, members' repeated assertions of economic insecurity influenced both the conduct of meetings and the interpersonal relationships that prevailed within the group. In a voluntary association like Alcoholics Anonymous, where groups are financially autonomous, the very existence of the group depends on the solvency of its members. Scarcity not only creates personal hardship on a daily basis for recovering alcoholics, but also produces feelings of envy, inadequacy, and resentment whenever members find themselves unable to contribute on a regular basis to the common good. As a self-help group, dedicated to enhancing the health and well-being of its members, Moral Support experiences as precarious an existence as that of its individual members. Moral Support, like most Mexican A.A. groups, is indelibly affected by poverty. By allowing the men to speak in their own words, this book is designed in part to show how economic marginality influences the struggle for health and survival among unemployed and underemployed workers in Mexico City. In this great metropolis, the destination of millions of poor migrants from the countryside, newcomers strive to recreate the texture of life in their small communities of origin. As shown in the final three chapters of the book, Moral Support, like many Alcoholics Anonymous groups in Mexico City, is intimately tied to the immediate neighborhood in which members meet. This circumstance helps affiliates to reestablish the bonds they lost before joining A.A. For these men, A.A. produces a sense of community involvement and semblance of control over their futures. At the same time, it would be difficult to deny that the problems experienced by Moral Support are engendered at least in part by the presence of confrontational personalities, driven by unambiguous ideas of correct procedures. Further, Moral Support's goals are inherently contradictory, a circumstance that occasionally operates to the detriment of group survival. It is these micro-level social processes, placed in relief through detailed field investigation, which form the core of this book. At the same time, we must constantly bear in mind that Moral Support, like all self-help groups, functions within a wider socioeconomic context. To a significant extent it is the conditions imposed from above and beyond their small neighborhoods that determine the fate of groups and their members. Hence, especially in Chapters Two and Eight, we shall examine what Merrill Singer (1986:114) calls "the encompassing socio-economic forces shaping contemporary drinking patterns."